You know that moment in the day when you come home and want to prepare a delicious dinner? Then you remember that after the last time you cooked you left a huge pile of dishes to wash, so the excitement goes away and you just give up the idea, right?! Did you know that washing dishes can help you live more fully? In today’s video we’re going to talk about why washing the dishes is such a healthy habit that everyone should include in their routine. According to researchers in California, washing the dishes consciously can bring great benefits to your life. Some participants were given a pre-dishwashing survey that included two types of texts. Half of these people had instructions inspired by tranquility and meditation which suggested that they focus on the act of washing the dishes, on all movements, breaths and senses involved in their daily chores. The other half received only a descriptive text about how to correctly wash dishes. With this survey, they found that the people who did their chores consciously (by smelling the soap, feeling the temperature of the water and touching the dishes) felt 25% more inspired and 27% less nervous or stressed. Meanwhile, the group that did not consciously wash the dishes didn’t gain as many benefits. I bet you were convinced that the only ways to fight against stress was to take a nice walk in nature, have a pleasant evening with friends, drink a good glass of wine or watch an interesting movie, right? Yes, all of this also works very well, but when you can’t do those things and you still need to relax, you can simply… wash your dishes! According to Adam Hanley, this study was developed to use everyday activities to promote a heightened state of consciousness and thus increase a sense of well-being. Doing household chores doesn’t have to be boring and can be a great time to connect with yourself and let your thought flow freely. 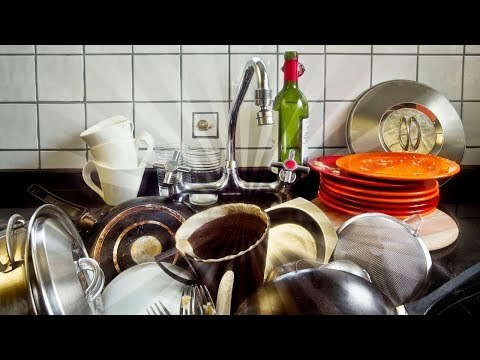 So before you put off washing the dishes again, you’d better reconsider, and remember that by washing them you’ll be cleaning your house and de-stressing, all at the same time!